It seems that General Motors has found the 2012 Chicago Auto Show to be the best place to uncloak the cars it has veiled for long. 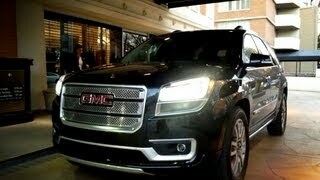 The auto show witnessed the showcasing of a fully refreshed General Motors manufactured 2013 GMC Acadia. The designing brains behind the model seem to have carried out a series of redoes on the herculean crossover utility vehicle to finally fabricate the vehicle to the form in which it has been presented in the auto show. These included new front variance, headlight details and new interior features as well. If you take an exhaustive look at the front of the car, you’d find that the CUV exhibits a new grille that setting a more vertical nose. Apart from this, the front of the Acadia 2013 attracts the eyeballs of buyers with diffused LED daytime running lights on both projectors with a provision of choosing High Intensity Discharge (HID) headlight-equipped models too. 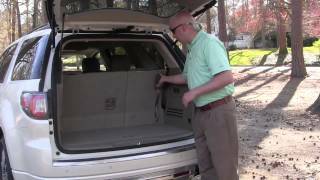 As soon as you decide to take a look at the back of the car, you’d find that the Acadia features wrap-around glass, with a redesigned spoiler that gives it an edge over other CUVs available in the market. The traction hasn’t been neglected at all. GM has introduced wheel design preferences too, which includes choices among 18 and 19-inch wheel sizes. Moreover, the interior design by the automaker includes elite French stitching and red interior lighting. 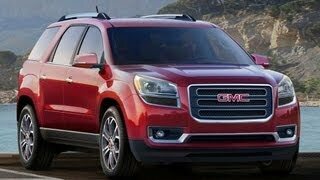 However, unparalleled aluminum trim works have been included in the high-end versions as well. 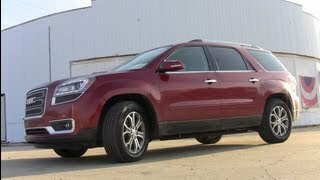 The GMC Acadia 2013 is reported to induce GM’s first ever center air bag safety feature, leaving behind any second thoughts regarding safety of driver and front passengers in high impact accidents. As per company officials, the air bag inflates from the right hand side of the driver’s seat while stabilizing occupants during the crash at the same time. 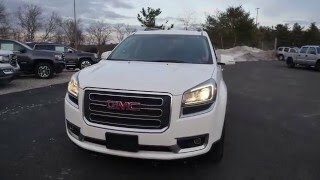 As soon as our concentration turns towards the engine and performance of the engine, the 2013 Acadia proves that why GM is considered to be one of the finest automakers on the planet. A 3.6L DI V6 engine with variable valve timing is the powerhouse of the car that generates a horsepower of 288HP @ 6300RPM and a peak torque of 270 lb-ft, with a towing power of 5,000 pounds. The powerhouse of the Acadia is reported to feature a 6-speed automatic transmission, thus eliminating the hassle of gear-shifts. Buyers will have the option choose between front wheel drive and all-wheel drive models. The light weight design, fully-independent suspension and impressive handling ensure a smooth drive one can only imagine about. The company, however, hasn’t disclosed the price-tag of the car and asked everyone to stay tuned to the updates of the car to get further induced details of the car.